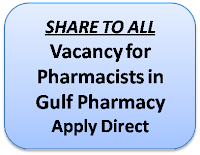 Gulf Pharmacy, Dubai as a part of expanding team and looking for new members who hold a degree in Pharmacy. The vacancies of Pharmacists must hold an Education and Experience of Bachelor's Degree in Pharmacy, 3 years UAE experience, MOH/DHA Licensed. The personal characteristics include good communication skills, -an interest in the health and well being of people, the ability to train and supervise others and attention to detail. Kindly contact them directly. 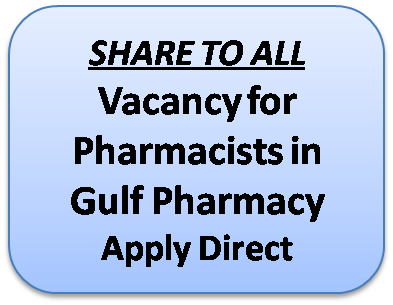 Here is the address and application facebook page of gulf pharmacy.